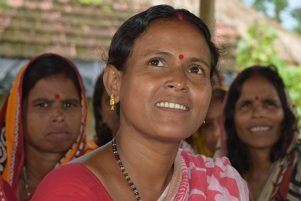 Durganagar Marine Fisherwomen’s Collective at Durganagar village of West Bengal’s South 24 Pragana district had faced many ups and downs due to lack of proper leadership since its inception in April 2013 with 25 poor fisherwomen. Most of them were involved in catching fish from nearby Chunpidi canal and engaged in sorting and cleaning fish as daily wage based labourer. This really did not help them earn more or add to their gross family income. The collective facilitated by a local NGO Digambarpur Angikar with support from ActionAid India and European Commission opened up a new horizon before the women of Durganagar of new hope and better future. A total of 40 such collectives have been facilitated across the two sates of West Bengal and Andhra Pradesh. In the initial days, they had little knowledge on working collectively, so the members started collecting monthly subscription of Rs. 20 per head as their saving. They decided to go for piggery, but couldn’t manage the business because of less capital and so they sold off the pigs at minimum prices and shared the principal amount with a meagre profit among themselves. With the little turnover, they started poultry farming. During the process, some of the members left the collective and there was turmoil in the group. It was then Sarbani Barman, a 33 years old housewife and a mother of three daughters, who was selected as the leader of the collective and she took the responsibility of taking the collective in a new direction. Before becoming part of the collective, she used to do tailoring at her home. ‘I had never thought that I would be part of the collective. When Saiba Paik, one of my neighbours told me to accompany her in a meeting organized by Digambarpur Angikar, I went out with the thought that I would get a chance to spend some time outside home. Reaching there and attending the meeting gave me a total new perspective about women’s life. It was then that I made my mind to get involved in the collective and work towards its betterment ,” said Sarbani. Initially she was only a member of the collective, later because of her dedication and commitment she got selected as the secretary of the collective. Sarbani’s involvement gave the group a new direction and stability. She brought all the members together again, discussed on issues in the collective and acted accordingly. The collective prepared their business plan where they decided to take up mixed carp rearing in a leased pond, and this provided them a good return. She took initiative to increase the number of members in the collective and in 2016, a total 45 women were members of the group.Every member of the collective was actively involved in the functioning. Besides their fishery business they also did potato cultivation in 10 katha of land (0.84 acres) and got six quintal of produce. Sarbani leads the process and motivates others to take active part in the activities. She believes that women can only make their own path for empowerment, and she herself has realized this from her involvement with the collective. She expressed that, “it’s a great feeling, when we see respect for us by the people, and it gives more happiness than the economic return. We did not think we would reach the stage where we are today; now we have a dream and the confidence to move ahead”.